on the twisted pair cabling. The TM-903 Multimedia Cable Tester is a hand-held test instrument that lets you verify and troubleshoot the LAN cable of twisted pair. It displays graph wire-map, opens, shorts, miswires, split pairs and the remote ID number all on one screen. Using multiple remote ID up to 8 locators to test on RJ-45 (UTP, STP) LAN cable, video coaxial cable and RJ11 voice cable. 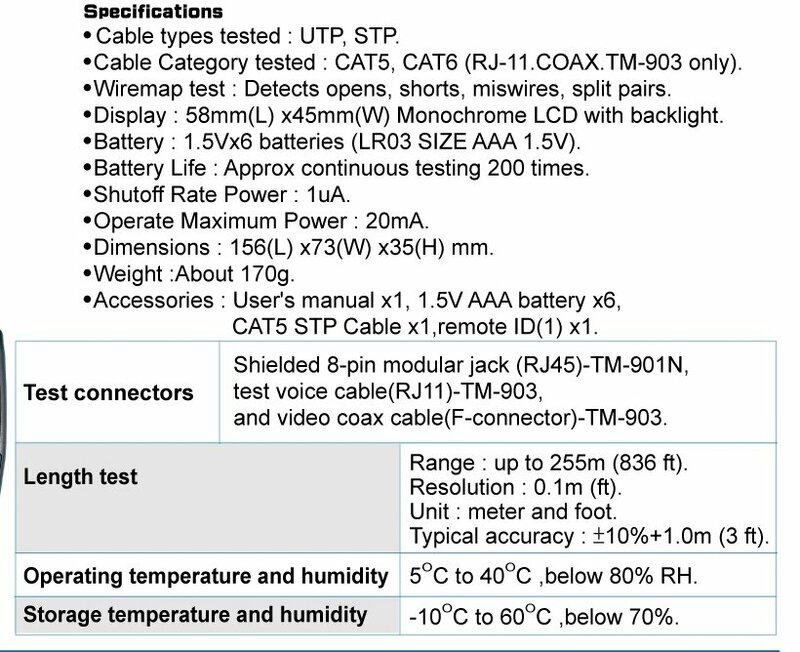 LAN cable (UTP, STP), video coaxial cable and voice cable. 5 to 40 ºC, below 80% RH. -10 to 60ºC, below 70%. 156(L) x 73(W) x 35(H) mm.